When I brought this skirt home, I felt like a victor, proudly flaunting my thrift, and bargaining skills . The joy of reasonable ways to get what we want- I totally understand that now ! I love that skirt! Such a great color! WOW..u look super gorgeous..n that skirt is a beauty. u really rock the crop top trend..kudos to u. Such an awesome outfit you styled it just perfectly and great pics. That skirt is really sooo nice. Cropped top on my wishlist now!! Great styling babes! I know this outfit looks great on you!! !Love that top and of course the midi..lovely! You look so gorgeous! I like the colour block! That is a very pretty skirt! The color looks great on you indeed! I love the length! I got a sweater last week that I felt the same about, only 10 eur! your skirt is beautiful, I like so much the color! Super blog you have, love it!! wow! what a beautiful, bright color! 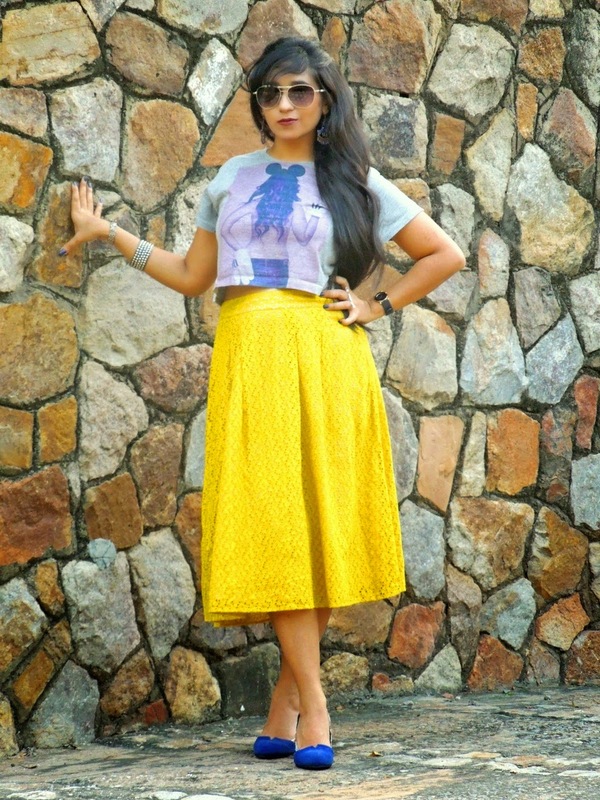 and loving your arm party..nail color..
this skirt is awesome..totally perfect for delhi autumn/winters...you look totally groovy!! Hey, thanks so much for visiting my blog! yellow looks so happy and gorgeous!! fab outfit!! 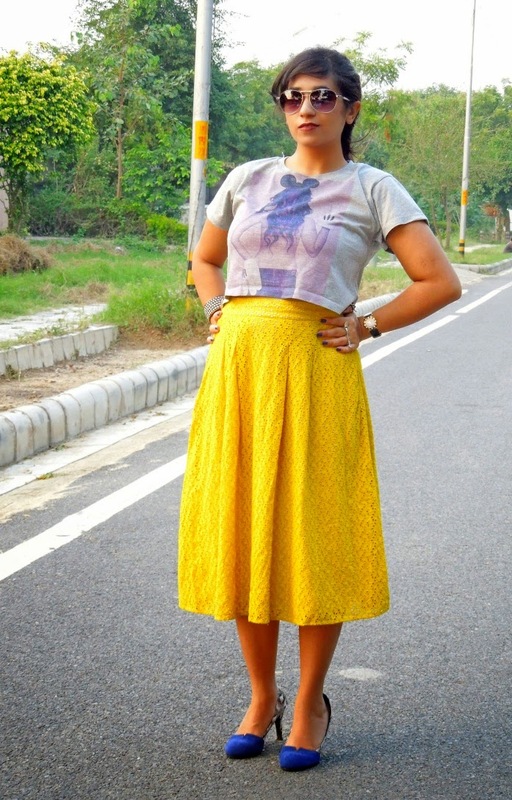 Love your skirt and accessories! :D Its so unique different and yellow really looks great on you! No wonder all the hard work you did paid off! Yellow really looks good on you! Gorgeous skirt, love it dear!!! such a gorgeous outfit! 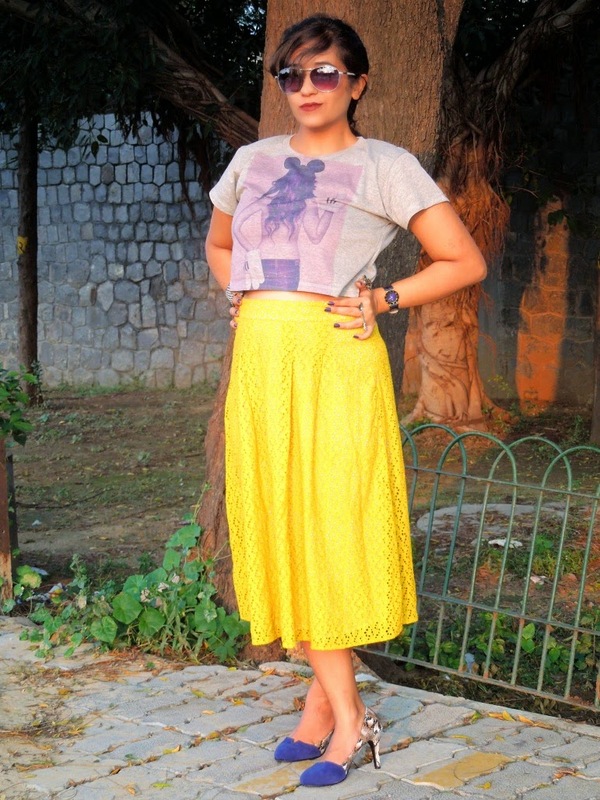 the yellow skirt just sticks out against the blue/purple hues of your top and shoes. very creative!